First, in the context of this passage “the grace of God” was the phrase used in Acts to describe the remarkable life-change of those who believed the Gospel. Luke records that “numerous people” of Antioch believed and “turned to the Lord” (11:21). The city was filled with about 500,000 people of multiple ethnicities (e.g., Greek, Egyptian, Persian, Arab, Jews), and they were called Hellenists because of their full submersion into the Roman-Greek culture of Antioch. As these Antiochians were converted, Barnabas celebrated their visible transformation. The self-absorbed pagans of Antioch were turning to the Lord and were being reshaped by God’s grace. Second, Barnabas was so stirred by the authentic change of this “first international church” (Stott, p. 203) that he interrupted his stay in Antioch, departed for Tarsus to find Saul, and returned with him to live with these people of grace (11:25-26a). Barnabas considered this grace environment to be the best place to encourage Saul in the ministry. Church history proves the correctness of Barnabas’ decision; for within a short time Saul penned his first inspired words of grace: the epistle to the Galatians. Third, as Luke concludes this story in Acts 11, he writes that the transformation of the Antioch believers was not only visible to Barnabas but also caught the attention of the city of Antioch. Luke concludes, “in Antioch the disciples were first called Christians” (11:26b). The appellation “Christians” may be “of more significance than might appear on first sight” (Polhill, p. 273). It was the term used by the “unbelieving public” (Stott, p. 205) to describe these new believers. The grace of God had so altered the daily lives of these believers that they were identified by the unsaved world as “Christ-followers.” In Bock’s words (p. 413), “The church . . . represented a distinctly counterculture way of life.” The result is clear: The public display of God’s grace in the believers’ lives caused the city of Antioch to see Jesus. 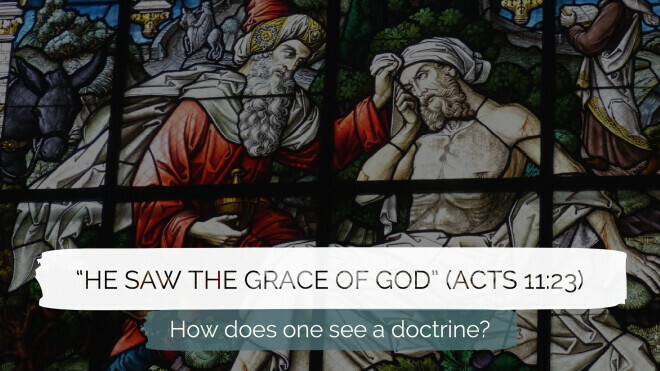 I began this short essay with the question: “How does one see a doctrine?” The answer should be self-evident by now from the text of Acts 11. Doctrine is truth, and truth, by its very nature, is transformative. In this specific situation, Barnabas saw the truth of grace in action as he observed the new believers of Antioch. What is instructive to me is this: Not only was the grace of God evident to Barnabas, but also to the unbelieving public. Grace had not just redeemed these new believers to God, but it also changed their lifestyle. And the public could not help but notice. This article is from the "Truth from the Agora" section of the Exposition, VBTS's monthly e-bulletin authored by President Daniel Davey. Click HERE to sign-up to receive the Exposition each month.